For years, it has been my absolute dream to visit the design mecca, ABC Carpet & Home. I have had dreams of taking a fabulous trip to New York where I would enter ABC and buy anything I wanted, picking out furniture and saying “I want that one” like some high society New Yorker. Well dreams, or at least parts of them, do come true. On a Sunday afternoon during my trip to New York I made it into the Manhattan-based store. I almost had to pinch myself to make sure that I wasn’t dreaming. With six floors of some of the most unique and gorgeous items you will ever see, I felt like I was on my own personal design pilgrimage. It was as if I had died and gone to heaven. Here are just a few highlights from my trip to this design mecca. To start the day, my mother, sister and I went to brunch at Pipa, one of ABC’s many restaurants. Knowing we would be busy exploring what is a vast building, I thought it would good to start off the day with a light breakfast of pancakes and coffee. Little did I know that this restaurant would be my first introduction to the incredible design showcases at ABC. With hundreds of twinkling chandeliers hanging from the ceiling it was like eating in an old Spanish castle. Absolutely marvelous. I was immediately struck by the awesome beauty that met us on every floor, from creamy white sofas to beautiful linens, pillows, and textiles. The ABC catalogue is full of furnishings that can only be found within its walls. People from all over the world seek the furniture in this flagship store. More impressive than anything you would ever see in a department store or chain, ABC offers beautifully designed pieces that are truly awe inspiring. With a mix of styles that range from traditional to contemporary, antique to modern, chairs like this Zulu Mama Chair from South Africa (on the left), and authentic period pieces like this Louis chair sit side by side in ABC’s collection. Lighting is so important, and at ABC lighting is an art form. Crystal chandeliers worth thousands hang from the rafters. And modern and traditional meet in gorgeous pieces like this glossy white chandelier (on the right). From dramatic fairytale bedding to purely modern decor, the bedding showcases were absolutely amazing. Pure white bedding was layered to create drama and warmth. I could have moved right in, but since that’s impossible, I decided to scribble down a few ideas for my own bedroom makeover (more about that in the coming months). 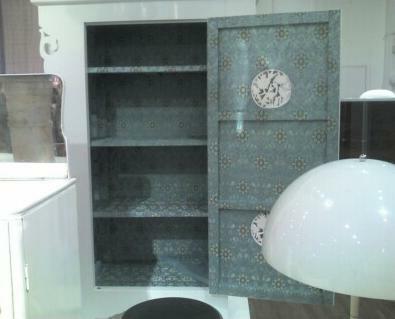 ABC has beautiful reproductions like this amazing Chinese armoire. This is the next piece that I absolutely must have. I have already begun saving my pennies, dollars, well everything, so that I can have this high-gloss piece that’s lined in a beautiful silk brocade sitting in my home very soon. My first visit to ABC will forever be a wonderful memory. For all of you New Yorkers, you are so lucky to have a space where you can sit down for an amazing brunch, shop six floors, and come home with unique decor that will truly add a special touch to that place you call home. I am so jealous. Oh well, I just hope that on my next visit I can come home with that Chinese armoire. Cross your fingers for me. When you decide to makeover your bedroom, be sure to check out this website: < HREF="http://www.elegantlinenspc.com" REL="nofollow">ElegantLinensPC.com<>. The linens are top of the line, and the sales associates give great design advice. Plus, they’ll send you a sample before purchasing so you can see the colors ITRW.